What is a "favorite game"? 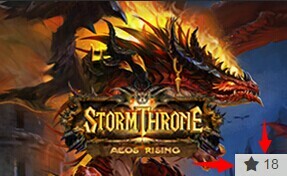 When browsing our games, you may notice a little star in the bottom-right of the game button. Clicking on that button will change the icon to red. This will mean that you have "favorited" a game, making it easier for you to find later. Where can I check my favorite games? After logging in, you can see the same star under your account avatar. Games you've "favorited" will appear here! This section allows players to find their favorited games in a single click. Any games you favorite will be added to the favorite section, allowing for easier navigation should you play more than one game. Clicking "PLAY NOW" will allow you to enter the game and start playing! All games you've favorited will appear here, so remember to click "favorite" on your games for easier navigation.